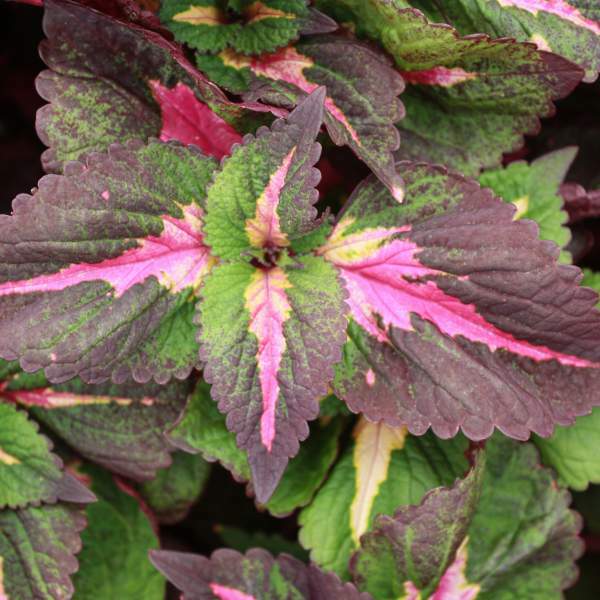 Perilla Tricolor is an upright, spreading annual that is often confused with Coleus by the untrained eye. Greenhouse-grown Perilla have green leaves that turn burgundy in the full sun. As a low-maintanence plant that grows in sun or shade, Perilla makes a good choice for containers, baskets or landscape use. Perilla mix well with Verbena, Calibrachoa, and Bacopa as they all have similar growing needs. For best results with Perilla, we recommend using a constant feed program of 150-200 ppm N. Maintain a pH between 6.0 - 6.5. Perilla is an upright plant and a rather fast grower. We recommend that you pinch them 5-10 days after transplanting to your final container. They may require a second pinch to shape the plant for your final needs. Perilla can be grown pretty close together as they are upright plants, but don't keep them pot-tight. Space pots as needed to allow air flow and penetration of light between plants. Plant growth regulators are not recommended for Perilla. The plant will get tall and leggy if allowed, but trimming and growing in bright light are preferred over PGRs. Perilla are responsive to Bonzi, but growers will need to trial all chemicals under their particular growing conditions. Aphids and whiteflies are the biggest pest problems for Perilla. Perilla Tricolor are prone to downy mildew, root rot and stem rot. Watch for botrytis while the days are short. This grey rot is usually associated with wet or humid conditions. You can prevent botrytis by allowing the plant to dry out between waterings, allowing for good airflow in your greenhouse, and spacing to allow the sun to penetrate to the soil level. The most common chemicals used to treat botrytis are Medallion and Banrot. Use them as a drench according to each label's instructions.